Tell us a little bit about yourself! What do you do, and what should we know about you as a creative? Los Angeles is where I call home. Watercolors are my bread and butter and my illustrations are precise and controlled while also being soft. They have their own small magic. I’m a Christian but you won’t find me drawing crosses, black-velveteen white-Jesus’ or putting bible verses on everything; my religion informs my view of why I’m creating and motivates me to continue improving. Currently I’m pursuing children’s book work (this is the dream) and other work (portraits, pop-ups, solo shows and print sales) to pay the bills. Most of my current work features people; I took quite a few life drawing classes in college and it turned out to be my favorite subject. It feels like I’ve spent the last 10 years trying to figure out what I really wanted to do in the art world and for the first time I am settled and focused. It’s a really nice feeling. I love your soft illustration style - can you talk a little bit about how you developed that? Were you always drawn to more muted colors? Thank you! When I was 11 or 12 I decided I wanted to be an artist when I fell in love with Digimon and that style stuck with me for a long time. When I decided to change my style I focused on breaking my old art habits. Now I use shapes, colors and shades to define my shapes; I use lines more sparingly and I also developed a completely different artistic language for drawing people’s features. As far as colors I used to be quite intimidated by using them so I started using only one or two colors in my paintings. I slowly became more assured in my choices. You can tell though that I’m still very conservative with my pallets but now it’s because those are the colors that I love. 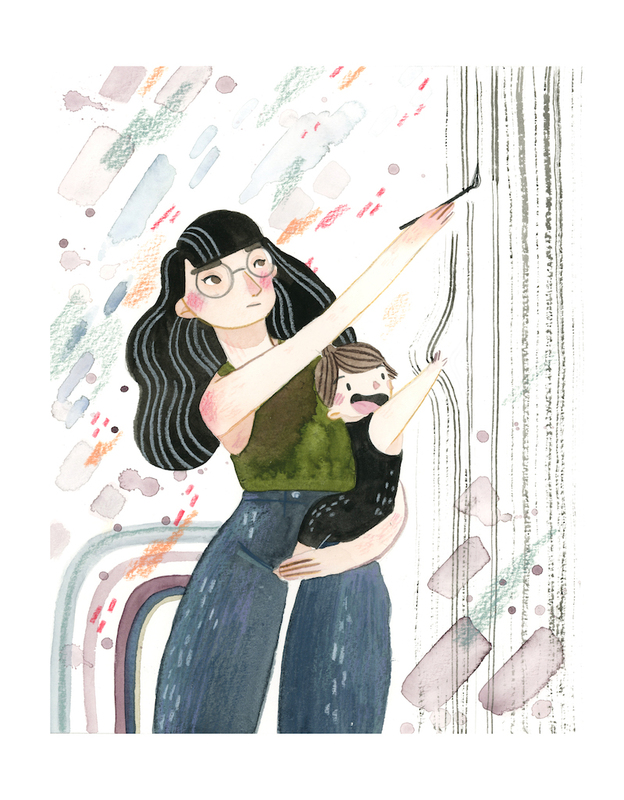 How did becoming a mom change your art? Becoming a mom has completely changed my work! Style, themes, work habits, work space (I now work in a closet so I can keep all my x-acto knives and hazardous etc. away from her). When I found out we were having a kid I went through a difficult transition mentally. At first I was mourning the loss of my time and self but since becoming adjusted to the changes I’ve become a better artist. The loss of time has forced me to use what I have left more intentionally and I’m taking it more seriously. 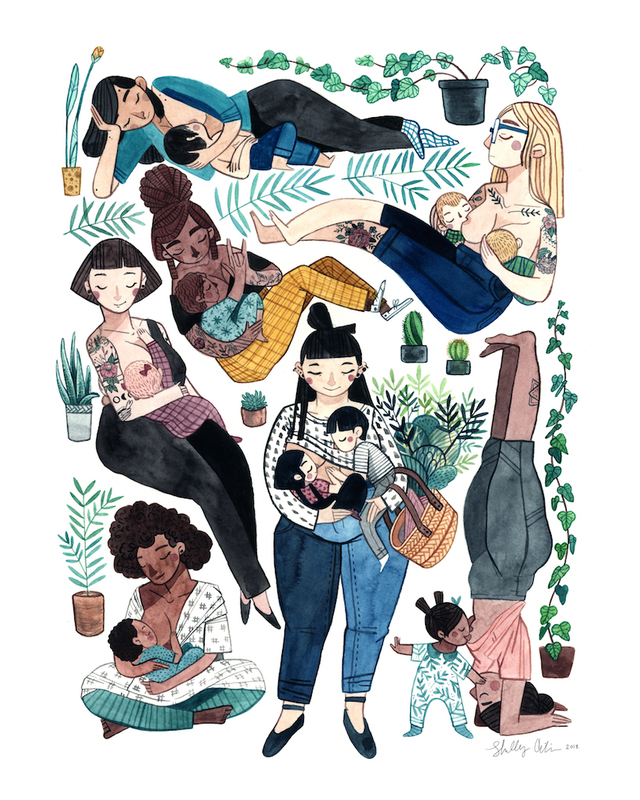 I also had some postpartum depression that left me feeling not as in touch with my emotions and for awhile I was worried that I didn’t love my baby. It’s not how you see it in movies and tv. But as I’ve become acquainted with this little human I know I love her even if my feelings are occasionally still missing. Most of the time I only want to draw her and I have sketchbooks mostly filled with drawings from our outings. I’m capturing her little gestures and thoughts. Somehow that helps me know that I love her. Otherwise I wouldn’t be so obsessed. What's the most challenging part about the work you do? Recently there have been two most challenging parts, though they’re kind of linked. One is not letting myself be influenced by all the art I see on social media and the second is walking my own path. I’m more content to be a follower, it feels safer to me and for a long time I’ve trusted what others said over my own instincts. This comes up in many different parts of my life but art is where I feel the tension most. It’s also where I’m trying to push back the most. Small steps. What's the most rewarding part about the work you do? What makes art rewarding to me is pushing past the difficult parts and finding success in the completion of the project. Sometimes I even forget to post my art to social media because the majority of my happiness comes from me seeing the finished image and knowing I did it even though it was hard work. Occasionally I get caught up in creating just for likes and attention but the process is really what motivates me. Oh and money. Money also motivates me. If you could identify a theme in your illustrations, what would it be? Do you gravitate towards that theme on purpose, or does it just come through naturally? It’s weird because I think I do have a list of general themes: motherhood, snuggles, acceptance, love. But I didn’t set out to make those my themes (or really to be that rosy-eyed and cheesy). I am an impulsive person and planning is not my strong suit so this all comes from just making what I want. Conflict is something I avoid at all cost so you will see little of that. I am incredibly snuggly and a hard-core people pleaser (I’m working on it). Maybe my work is more tied to my own personality than I’ve previously realized. If you could tell an aspiring creative something they should know about pursuing a creative life, what would it be? If I try and think about what to say to an unknown person with an unknown personality about creativity I’ll get lost in the unending amount of possibilities of what they may need to hear. So, instead I’ll tell you what I would tell a younger me about the creative life: You have so much more time than you think you do. Use it. Don’t worry about what other people are doing, don’t try to find what’s “right”, find what you like and pursue it! If you really really want this you can have it but you’ll need to sacrifice and sweat and fight for this. It’s hard, but it’s worth it. Also, young-Shelley you don’t really want to do graphic design, just go do Illustration. Where do you see yourself creatively a year from now? Best case scenario, what will you have accomplished by then? Check Shelley out on Instagram and her website.